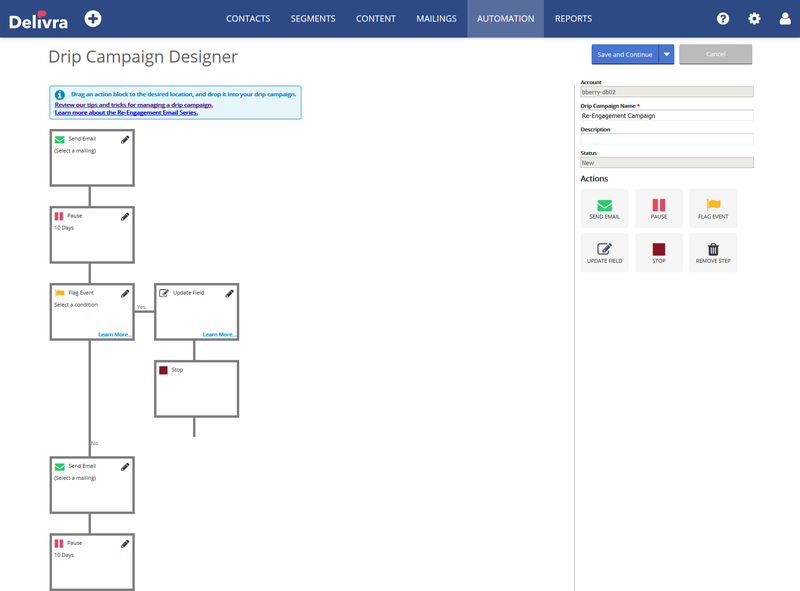 Email marketing software provider Delivra has just launched a new package dedicated to e-commerce marketing automation. This version of their platform called Delivra Commerce, at the moment offers integrations with popular eCommerce platforms Magento, Shopify and WooCommerce. The solution allows for post-purchase and shopping cart abandonment email marketing campaigns. Delivra Commerce users can automatically create segments based on synced purchase data from Magento and WooCommerce categories or Shopify product types. These can be used to personalize mailings for increased revenue. The real-time shopping cart integrations help online retailers to send abandoned cart messages to recover potential revenue and remarket to consumers through personalized, automated email. Delivra Commerce also includes integrations with Google Analytics Commerce. Through which users can access revenue, purchases and conversion rates directly from their reporting. The screenshot below shows summary information for Revenue, Purchases and Conversions related to emails and other sources. 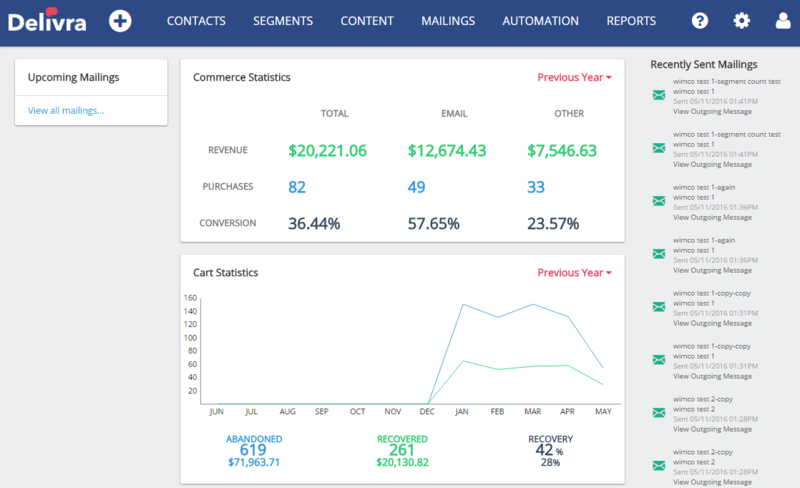 The tracking statistics report view includes the Revenue, Purchases and Conversion Rate attributed to each mailing. Delivra has also launched a new Automation Dashboard featuring intuitive navigation for all drip campaign-related activities. A key feature is the ability to create a “Flag Event” based on a purchase from a mailing, allowing users to “set and forget” automated campaigns while controlling the timing and message of commerce-related communications. 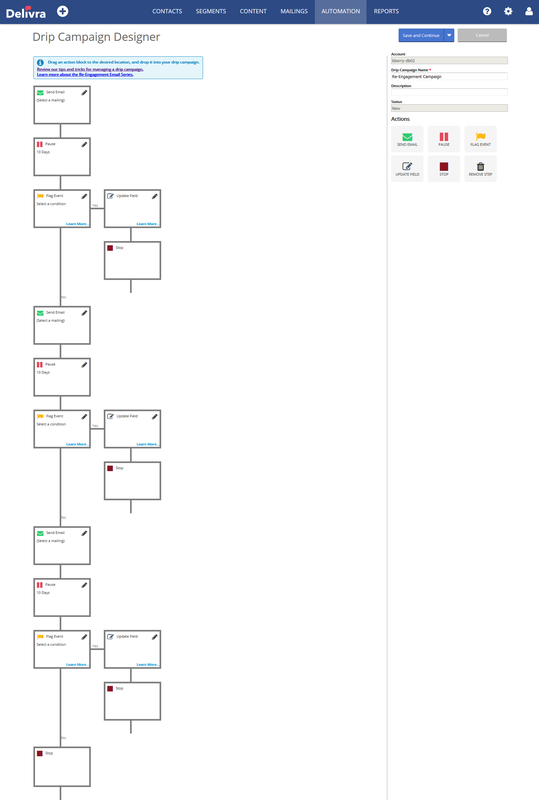 “Flag Events” allow a marketer to evaluate criteria, and branch a workflow step into two paths. For example, a marketer may choose to evaluate whether or not a recipient opened a mailing, clicked on a specific link, purchased from the ecommerce store, etc. Flag Events are important because they allow a marketer to control what will be done next for the recipient, based on the recipient’s prior action (or inaction). A marketer may choose to send different emails, update data fields, send SMS messages, etc. Here is an example of the reengagement workflow, click to see the complete pre-defined Re-Engagement email series. Delivra Commerce is available as a software package that includes commerce platform integration, additional segmentation options and cart recovery over their other packages. Delivra tells us that their roadmap includes tracking browse behavior, supporting product recommendations, and providing commerce support for other platforms. The Email Service Provider will also be expanding their Automation capabilities to support additional features.